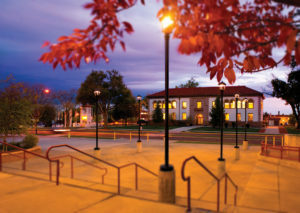 Home / Blog / Franken Construction is excited for another great partnership with New Mexico Highlands University! Franken Construction is excited for another great partnership with New Mexico Highlands University! We look forward to helping bring this historic building back to the forefront of this beautiful campus. Las Vegas, New Mexico – The New Mexico Highlands Board of Regents awarded the primary construction contract for the historic Rodgers Hall renovation to Franken Construction Company at a public hearing Nov. 19. Over the years, Franken Construction of Las Vegas has completed historical renovations at Highlands such as the award-winning McCaffrey Historic Trolley Building that was finished in 2016 for the Media Arts and Technology Department. “The total construction contract awarded to Franken Construction for Rodgers Hall is $3,073,500,” said Sylvia Baca, Highlands University facilities and planning director. “This contract includes the materials and labor to renovate the majority of the interior of the building. “Some of the design highlights for the building on the first floor include the heritage room, a spacious and modern classroom, and a state-of-the-art governance board room,” Baca said. Baca said after the renovation, Rodgers Hall will again house the Office of the President, Office of Academic Affairs, and Office of Finance and Budget, which will all be located on the second floor. Baca said the Rodgers Hall renovation will take approximately 10 months to complete after it begins in December 2018. “The university is working with the New Mexico State Historic Preservation Office to preserve historic elements of Rodgers Hall. For instance, the interior renovation shall protect the historic Depression-era murals by Lloyd Moylan,” Baca said. The architect for the Rodgers Hall project is Baker Architecture + Design based in Albuquerque. The architectural firm also designed the McCaffrey Historic Trolley Building. “I really value Baker Architecture’s vision for designing simple, functional, and beautiful spaces,” Baca said. Funding for the Rodgers Hall renovation comes from General Obligation Bond C for Higher Education that New Mexico voters approved in 2016. “In addition, Highlands will be seeking $1 million in funding for the Rodgers Hall project at the 2019 New Mexico legislative session. This funding would be used to upgrade the elevator, purchase furniture and equipment, and complete other interior finishes. It would also be used to redo the exterior stucco for the building as well as restore the tile roof,” Baca said. Rodgers Hall was built in 1934 and originally served as the Highlands library. Architect John Gaw Meem designed Rodgers Hall in the Spanish Colonial style with a French tile roof. In 1988, Rodgers Hall was added to the National Register of Historic Places. Once Highlands built the first phase of its current Donnelly Library in 1966, Rodgers Hall began housing administrative offices.